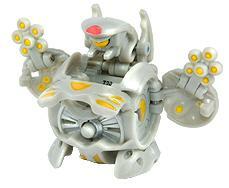 Lockanoid is an unreleased BakuCloser Bakugan. The only part that can be open by its magnet is its head and it is also Auto-Close. All other parts can be open manually (feet) or by pressing the button in the middle of its chest (by lifting the flap manually; the cannons or "arms"). It looks like he has machine guns were his arms are. A Darkus version has 900 Gs, a Ventus version had 740 Gs, and a Haos version has 860 Gs. Purchase your Lockanoid from Amazon now!